High up in the Andes mountains of Peru, more than three miles above the sea a tiny rivulet tumbles from the lower edge of the ice field. It looks like any mountain stream, yet in fact this is the beginning of the mightiest river in the world, the Amazon. It is ice cold and crystal clear and only ankle deep, but as it cascades down, other rivulets join it and it picks up speed. Soon it is a full-fledged river, turned muddy brown by its furious descent. For hundreds of miles it roars through mountain gorges. Then, with explosive force, it bursts into the jungle below. 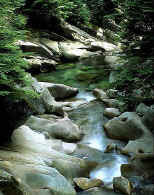 Hundreds of tributaries or smaller rivers pour their waters into it as it surges across the wilderness. This together with the torrential rains makes it almost a moving inland sea that drains nearly half of South America. The Amazon knows no channels; it tolerates no obstacles. It pours in fury across thousands of square miles of jungle drowning and destroying everything that stands in its way. In places its ultimate banks are 60 miles apart; the main channel itself is often so wide that you cannot see the far shore. So great is the river's power that even when it reaches the Atlantic, the Amazon refuses to die. It floods the ocean with fresh muddy water for up to 200 miles offshore. Paul's prayer, inspired by the Holy Spirit of God, is that believers (those who have trusted the Lord Jesus Christ as Saviour) might know what is the exceeding greatness of His power toward those who believe, according to the working of His mighty power. God is able to do exceeding abundantly above all that we ask or think, according to the power that worketh in us (Ephesians 3:20). Mightier by far than the surging torrent of the Amazon River of South America is the power of the eternal, immortal, invisible God. And He wants to work in and demonstrate through your little life and mine, all that He is, and all that He is able to do. All He asks for is a humble and willing heart. Does He have yours?